I love the UK in the spring. There is such a great, happy vibe with everyone feeling the same weightlessness of not having to wear their winter coats and positive effects of vitamin D on the skin. It's gorgeous. And in London, there is nothing better than heading out to bask in the sun whilst visiting a market or two. 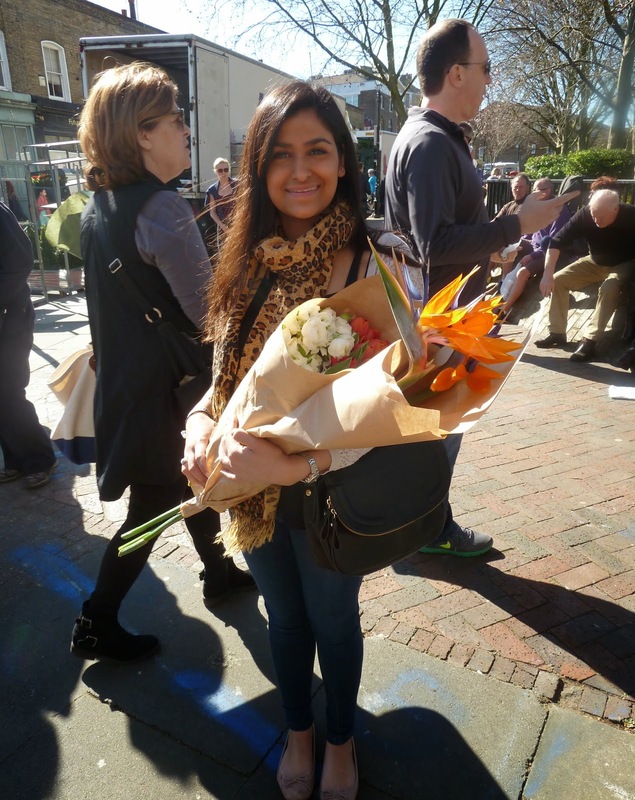 For me, the first stop on the 2014 tour of London markets took me to Columbia Road to pick up some pretty and colourful flowers to brighten up the flat. Flowers are something I grew to love when I first got my own place. My mum used to have loads of them about the house, Lilies mostly, and they always smelt beautiful and made the place seem really happy, so it's no wonder I've followed in the footsteps. Mum - you'd love these, four stems for £6, the house would come alive! Without fail each week there will be a new bouquet in the flat - but to mark the start of Spring, I thought it was time to visit the Flower Market. 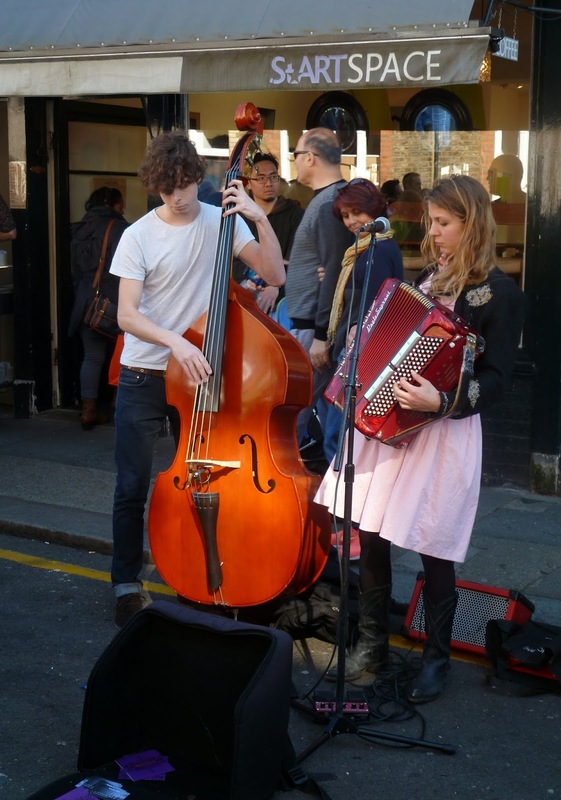 Columbia road was actually a bit of a mission to find, nearest tube is Bethnal Green, and then it's about a 10min walk if you know where you're heading (which we didn't!) So we ended up ambling through Brick Lane with the early morning market stallers setting up their displays for the day. We soon swallowed our pride and asked for directions, straight up to the top of Brick Lane, keep going and then turn right into a council estate and through the other side. Thanks lady! But who knew you had to walk through a council estate to get there? You neither? well know you do. We eventually rocked up about 11 and to say the market was in full swing would be an understatement. There was blues music being playing as we walked in to join the crowds and even country music further down. Not to mention the street was alive with the sounds of "Two for a fiver, come on love get your tulips here" and "Get your Orchids here, great value, best on the market." It was fab! Being new to the market, we decided to walk all the way through and mentally note the stalls we liked before committing, but little did we know it'd take about 40 mins to get from one end of the market to the other. People move at a snails pace as there is pushing and jostling to get to the stalls and men carrying plants for their wives and girlfriends on their shoulders; just shows the things we do for love! Having made it to the end of the market, we popped into a couple of the ceramics shops at the other end, there were some really nice pieces, but we both had one thing and one thing only on our minds. Any colour and many made out of egg shell and ceramic. Jewellery bowl anyone? For me - I was sold on the Birds of Paradise - these beauties remind me of holiday so much and I've never seen them to be able to buy them before so we each snapped up three for £6 (a pretty good deal compared to the other stalls). And then I spotted a bunch out the corner of my eye which I totally swooned over. 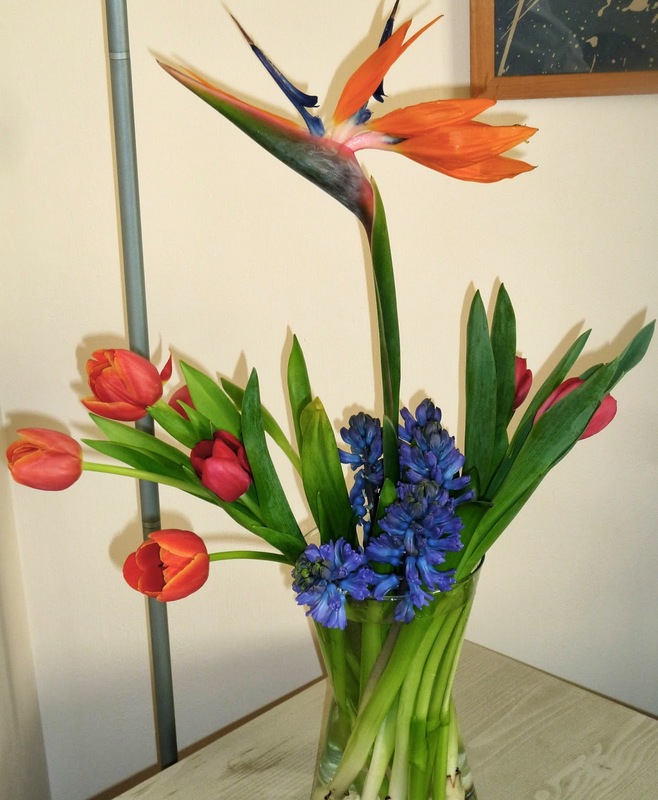 Purple Hyacinth with tulips - I was sold and picked up a bunch with hot pink and orange sun kissed tulips for £10. Done. Now £16 may seem like a lot on flowers to some, nothing to others, I just know I came away happy as my mate larry and couldn't wait to get them home and into vases. Although first we had to stop of for a drink. 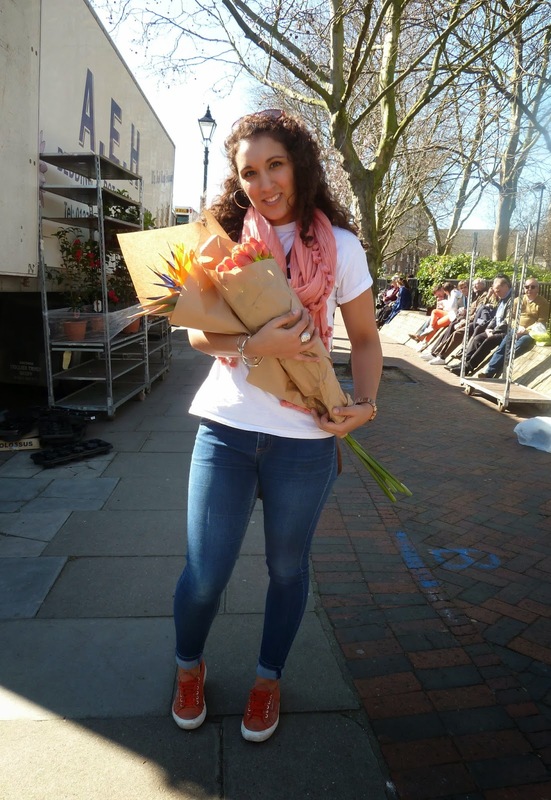 Flower shopping is hard work you know! We stumbled upon this little cutie on the corner on the way back into Brick Lane and popped in for a carrot and ginger juice. 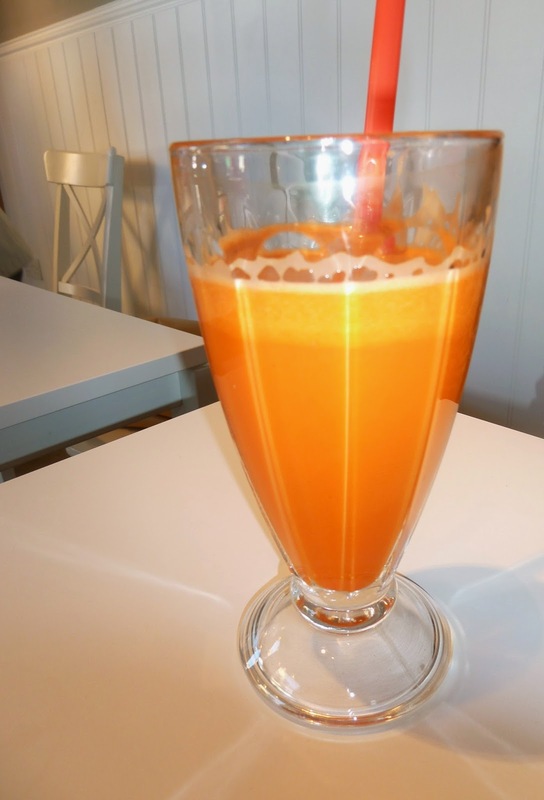 It was nice, more carrot than ginger, but it was just what we were after, healthy and not full of sugar. Might start making these at home - five carrots in one glass, get in my five a day! 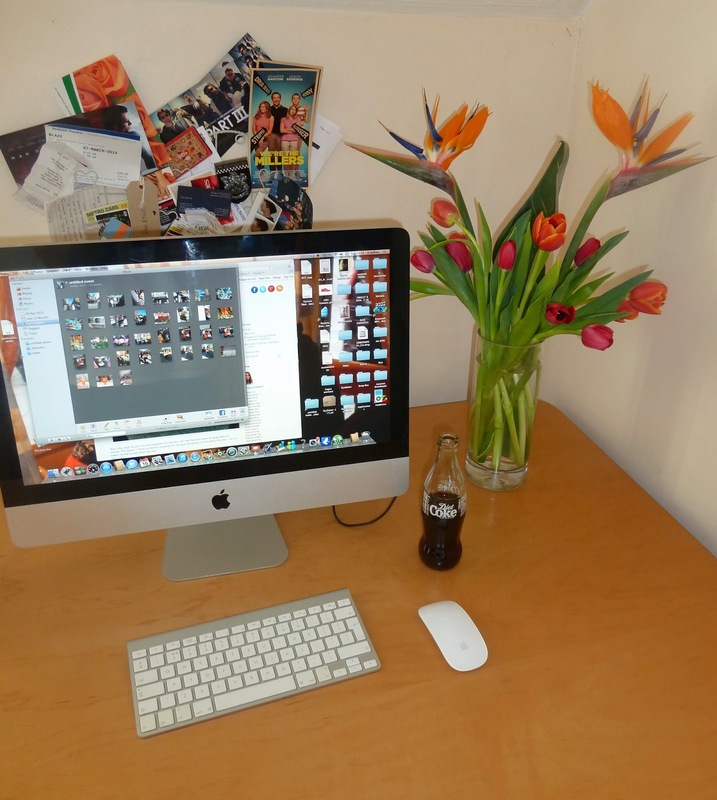 And now I'm sat here smiling as one vase is given pride of place next to my Mac and the other by the side of the sofa; the Hyacinth smell amazing. All in all, a great way to enjoy the spring sunshine. Good choice, looks like a great day out, beautiful flowers.